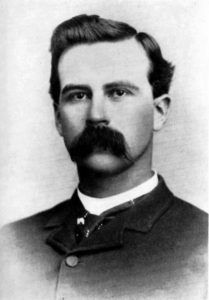 Jeff Davis Milton (1861-1947) – Milton was an Old West lawman who served for more than 50 years. Born in Sylvania, Florida on November 7, 1861, Jeff was the son of the Confederate governor of Florida, General John Milton. His father committed suicide toward the end of the Civil War, when it became evident the south would lose. After the end of the Civil War, he grew up on the remnants of the once-proud family estate. However, at the age of 15, he moved to Texas where he worked as a cowboy before lying about his age and joining the Texas Rangers in 1878. After spending four years as a ranger, he moved through west Texas, working as a sheriff’s deputy in various places before landing in southern New Mexico in 1884, where he soon became a U.S. Deputy Marshal. For the rest of his life he would hold a variety of law enforcement positions in Texas, New Mexico and Arizona before retiring in Tombstone Arizona in 1932. Milton captured a number of outlaws during his career, including William E. Walters, aka: Bronco Bill. He also killed John “Three-Fingered Jack” Patterson. A fearless officer and a master at firearms, Milton’s lawman career spanned more than a half a century. He died on May 7, 1947.